One of the fastest-growing and developing cities in India, Jabalpur is famous for its beautiful waterfalls and marble rock formation sites. Apart from its scenic beauty, Jabalpur can also be characterised by ancient temples and historical monuments as the history of this modern city dates back to the Vedic period, when Lord Shiva defeated three demons in this region and inaugurated the human settlement. As per legends, it also related to Chedi kingdom from the epic Mahabharata. However, later on it was ruled by several other dynasties from the early and Medieval Period of the Common Era. Located within the boundaries of Madhya Pradesh, it is perfect weekend getaway from the capital city of Bhopal. If you are looking forward to spending some time away from the heat of Bhopal, then Jabalpur will make a perfect choice. Read on to know more about this trip from Bhopal to Jabalpur and its places of interest. With a humid subtropical climate, Jabalpur experiences hot summers. Therefore, it is not a preferable destination amongst seasonal tourists during the summer season. However, for offbeat travellers and local tourists, it remains a perfect weekend destination due to the presence of lakes and waterfalls. If you are looking forward to savouring the perfect weather of Jabalpur, then the best time to visit is from October until the end of February. By Air: As Jabalpur is one of the prominent cities in Madhya Pradesh, you can catch a direct flight from Bhopal to Jabalpur. By Rail: Jabalpur is well connected to other cities and towns by rail and hence, you can catch a direct train from Bhopal to Jabalpur Junction. It will take you an approximate time of 6 h to reach your destination. By Road: Jabalpur is settled at a distance of around 320 km from Bhopal and hence, you can easily approach it by road. As route 1 is the fastest and will take an approximate time of 6 h 30 min, i.e., 1 h lesser in comparison to the other route, it is advisable to take route 1. Once you are on your way, you can also visit Sanchi and Sagar. Sanchi should be your first stopover not only on account of its historical significance but also due to its religious significance too. The major tourist attraction here is the Buddhist complex, which is believed to have been established during the time of the Mauryan dynasty and is visited by millions of tourists from all over the world every year. The Great Sanchi Stupa, one of the oldest stone structures in India, is the prime spot which should be explored while unveiling the beauty of Sanchi. From commendable architraves to wonderful architecture, each and every corner of this Sanchi Stupa, which was used by Buddhist monks as a place of Meditation, deserves to be studied. Sanchi is located about 50 km from Bhopal and 270 km from Jabalpur. Sagar is a beautiful city at a distance of about 165 km from Bhopal and 160 km from Jabalpur and is popular amongst tourists for its mesmerising Lakha Banjara Lake, which is a morning and evening destination for the local residents. However, it is also visited by several other tourists who come from other cities and towns to witness the majesty of this alluring lake. Apart from this scenic beauty, you can also visit its religious sites, which include Pateriaji and Neminagar Jain Tirth. Finally, you have set your foot on the lands of waterfalls, hillocks and historical sites after covering a distance of about 320 km. 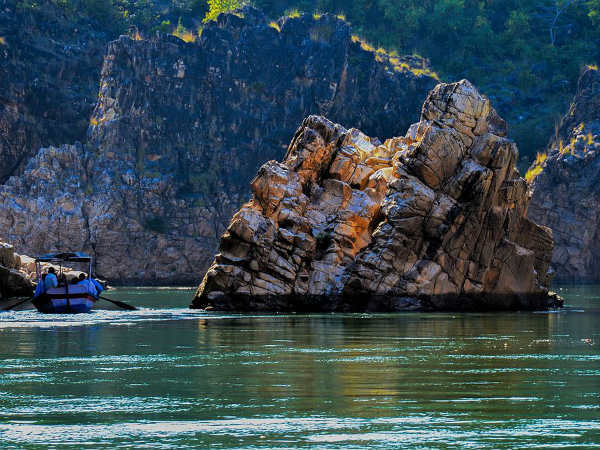 Jabalpur is dotted with innumerable marvels from the past and is blessed with numerous natural beauties. Once you are within its boundaries, following are the places which you should not miss if you desire to witness the best of Jabalpur. Madan Mahal is one of the most famous historical monuments within the boundaries of Jabalpur and hence, it is visited by thousands of history lovers every year. It was built during the 11th century by Rajgond rulers of the region and is nestled atop a hill, thereby, overlooking the town of Jabalpur. Even though the fort is in ruins today, it is still a place which should be explored on account of its historical significance. Without visiting the hamlet of Bhedaghat in Jabalpur, your trip is certainly deemed incomplete. It is the place where you can enjoy the beauty of Dhuandhar Falls, as it gushes down the hilly terrains, which are known for their marble rocks. Rani Durgawati Museum is a beautiful site which houses several ancient relics from the prehistoric era and was established in the year 1976. You can also watch several sections dedicated to Queen Durgavati here. Being an ancient settlement, how can it be deprived of temples and other religious sites? These beautiful temples where you can find a serene and peaceful environment include Hanumantal Bada Jain Mandir, Chausath Yogini, Nandishwar Deep and Osho Ashram. There are also several mini lakes and dam reservoirs located on the outskirts of Jabalpur. These beautiful lakes and their natural surroundings can certainly soothe your soul and let you feel the essence of calmness and composure. The list includes Bargi Dam, which is a beautiful destination for boating, and Hanumantal Lake, which is a beautiful spot for photography. If you never get tired of exploring places and desire to witness more of Jabalpur, then you can also visit Pisanhari Ki Madiya, Gurudwara Gwari ghat Saheb, Dumna Nature Reserve Park, the grand statue of Lord Shiva at Kanchar and the ghats of Narmada river, which include Lamheta Ghat, Tilwara Ghat and Kosam Ghat.